So your company has a few hundred products in various categories and you have sales people out in the field with your catalogs and sales brochures and data sheets. Wouldn’t it be great if your people had all of that data in a small and easy to carry tablet with an iPad business app? Yes it would and now they can. FatStax has a cloud based CRM which keeps all of this data in one place. They also have an iPad app that works in conjunction with this service to allow your sales people to have the data at their fingertips and present it more effectively. 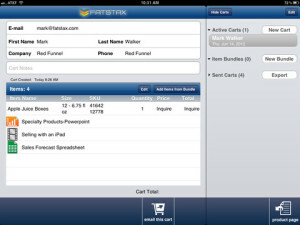 FatStax for iPad is an iPad business app which makes it easier to search multiple product sources so your people can find the information quickly. We all know that you sometimes have a short window to sell someone on your products and if you’re fumbling around looking for info…the potential customer gets bored very fast. You would expect any iPad business app to work with cloud data so that isn’t a surprise but FatStax also works in offline mode so you have all of your data on the device if you do not have a wifi or cell signal. 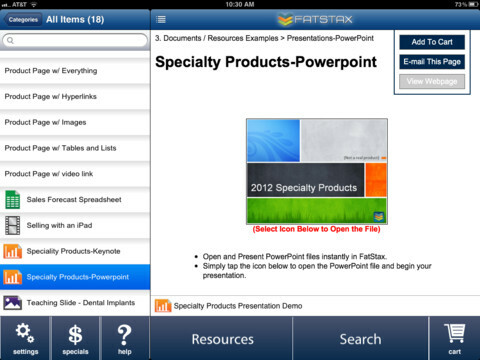 FatStax also has a presentation mode with presents your product details in full screen mode. I could see this as being the most effective feature when you consider many customers are convinced visually than by just reading a description on a page. When you have a large sales force…or even a small sales force there is always the possibility of conflicting information. One sales person may have product details and brochures that are up to date while another may have information that is three revisions old. 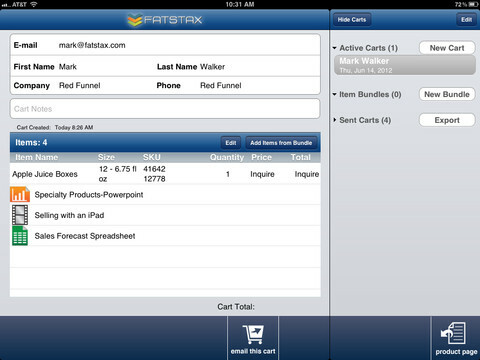 FatStax iPad business app solves that problem by keeping all of your sales people on the same page. If you update a brochure and put it into FatStax then everyone will be updated with that information. All of your sales team’s product information and sales collateral in one place for finding, presenting and sending. Brand your Interface – Get a customized look with the built-in color and logo options. Obviously iPads for all of your sales people is not exactly a small investment but if you combine it with this iPad business app and are able to make just one sale per sales person because of it, then that could potentially pay for the investment.